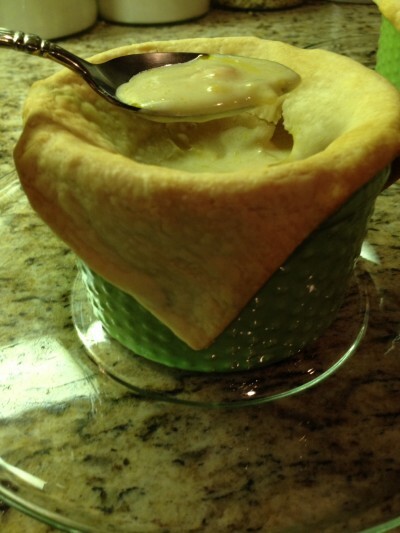 Only three items needed for this quick chicken pot pie recipe; two cans of hearty chicken pot pie soup from Progresso, four ramekins and pie crust. 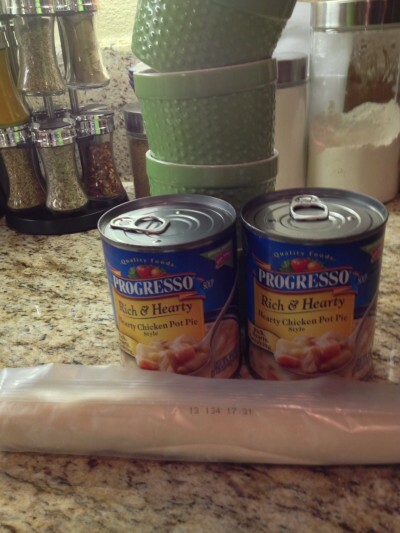 I paid only $6 for this dinner; pie crust $2 and two cans of soup for $4. What a bargain! 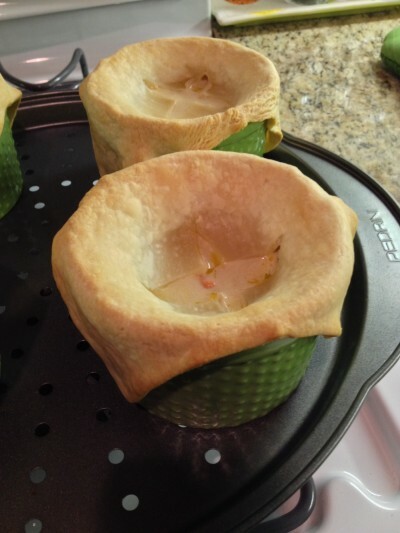 Place all four ramekins onto a tray for easy transference. 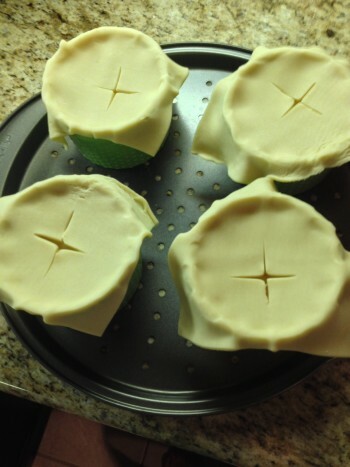 Keep these on the tray while they bake in the oven. Place these into the 375-degree oven and bake for 25 minutes. The center looks a little transparent, but trust me, it’s cooked. This is a perfect meal for the cooler months ahead. It’s hearty and hot and so tasty. Thanks for stopping by PeopleTreats! See ya next time! 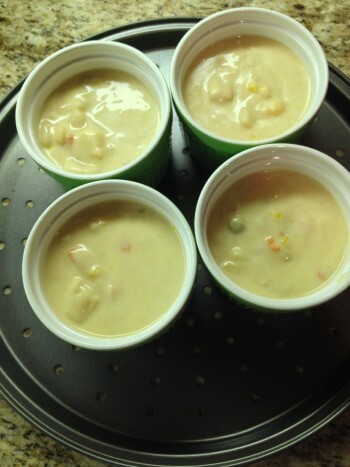 This entry was posted in Chicken Pot Pie, Home, Main Meals, Recipes II and tagged Chicken pot pie, easy meals, Food, Recipe, soup by mrewilson. Bookmark the permalink. Love the idea of these, but I’ll have to make mine from scratch! That sort of product ain’t for sale over here. Will have to Google and find out what’s in them as I’ve been wanting to do baked savoury pies for a while now. Oh, I can’t wait to see what you come up with. I bet it will turn out great! I can’t for the life of me make pie dough. I’ve tried and failed plenty of times. 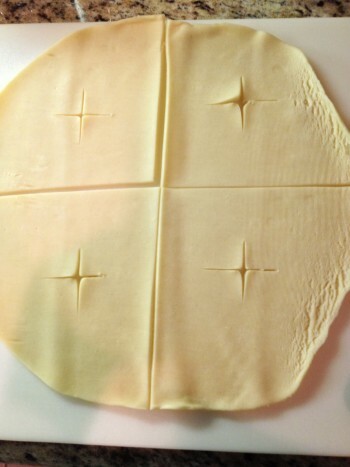 I just buy the ready-made pie dough. It’s just so darn easy to buy from the store, but that is one thing I would love to master at making. Thank you :)! It’s great as leftovers as well, just microwave for 2 minutes. Had one yesterday, tasted just as great.